They’re cheaper and more energy-efficient than air conditioners – plus can look pretty cool to boot. But which ceiling fan should you take for a spin? Canstar Blue looks at different types of ceiling fans, their features and prices, to help you make an informed decision. Ceiling fans may seem simple, but there’s a massive range of different types to choose from. It can be pretty intimidating to try to choose when it’s not exactly intuitive to figure out what makes one ceiling fan better than another. That’s why we’ve written this guide as a starting point to choose the best ceiling fan for your home. Let’s start with the basics. Ceiling fans are, as you’d expect, fans that are installed hanging from the ceiling. 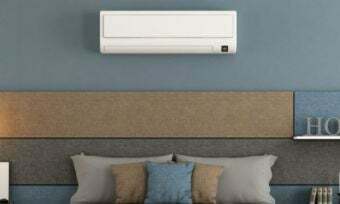 They are primarily designed for cooling, although some can also be used for keeping a room warm. We’ll explain how fans can be helpful during winter later on. Fans don’t actually make the air cooler – they just move it. When more air moves across our skin, our sweat evaporates faster – thus cooling us more. It also helps move heat away from our skin even when not sweating. Our bodies constantly radiate heat, which transfers to the air immediately surrounding us. When that air is moved away from us and replaced with different air, our skin has less contact with hot air and thus feels cooler. The toughest trade-off Aussies have to make every summer is the balance between suffering the heat and suffering the cost of running the air conditioning. Ceiling fans offer a compromise. Even if it’s not really hot, a ceiling fan can be a welcome addition to a stuffy room where there isn’t enough natural airflow to keep things fresh. Where you want to install the fan is also a major consideration. Fans are generally designed differently for inside and outside use. Most inside fans are not suitable for outdoor use. Before you choose a ceiling fan, also check your ceiling height. If your ceilings are quite tall, you may need to purchase a ceiling fan extension pole to hang your fan low enough to circulate air properly. Likewise, if your ceilings are quite low it may turn out to be too dangerous to install a ceiling fan – although this is rare. Most homes have their lights mounted on the ceiling – which is also where ceiling fans go. Unless you want to simulate the night club experience, with a strobing light effect from fan blades whirring over your light fittings, you may need to choose a ceiling fan with a light installed in its centre. It’s very basic, with a clean white exterior and four blades. The Arlec Classic is only for indoor use, has a reversible motor, and can be adapted to add a ceiling fan light. The blades are made of MDF while the motor is contained within a metal housing. It’s controlled by wiring it up to a wall plate (aka wall switch), with three fan speeds. This fan, with one of the lowest prices on the market, does the job without anything fancy. It’s priced down the lower end but is a step up in appearance from the very cheapest models on the market. The Airfusion Airlie has three plywood blades and a clean white finish, featuring a white light in the centre. The three air speeds are controlled by wiring up a wall switch – it’s also compatible with a remote control which is sold separately. It’s suitable for indoor use only. With four brushed aluminium blades, an energy-efficient dimmable LED light and remote control, the Futura Eco offers a higher end experience without going into the top end of the price range. It’s also reversible, so it can be used year-round in all weather conditions. This chrome fan is on the high-tech end of things, with four clear acrylic retractable blades, dimmable LED lights with colour control, and reversible rotation. The remote control can be used to change between three speed settings, adjust light brightness, and switch between three different colour temperatures (3000K Warm White, 4000K Cool White and 5000K Daylight). The Fanaway Evo1 is certainly an impressive ceiling fan. 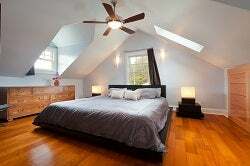 Ceiling fans differ mostly in construction and design. There are a huge number of brands available on the Australian market – let’s explore a few of the more prominent names in ceiling fans. This is by no means an exhaustive list. Inclusion here does not represent any particular endorsement of the brand. Offering both conventional and unique designs in fans with and without lights, Mercator offers something for more modern homes. You can make your fan look ultra-modern by choosing one of its matte black finished models, or match your warm wooden interior with modern takes on the old-fashioned natural wood bladed fans. Most popular for its more affordable fan offerings, Arlec produces ceiling fans across the full extent of the market from the super cheap up through the high-end, in white and silver finishes. They even offer fans with six blades. Offering both classic and unusual designs, Martec and its second brand Four Seasons bring some more artistic influences into their ceiling fan designs. If you’re not into the rounded oyster light usually found on ceiling fans, some models have completely flat or otherwise differently-shaped ceiling fan lights, which can help you match your new fan with the rest of your electrical fittings. If you’re looking for something really unique, even a statement piece for your ceiling, Hunter has some truly ‘different’ designs. Blades with unusual shapes and connections are common in the Hunter range, with styles to match all different kinds of interior designs, from rustic to industrial. Not to be confused with just Hunter, Hunter Pacific is said to produce award-winning original designs for more high-end home cooling solutions. It also offers a number of DC fan models, for those keen to invest in something quieter and more efficient. The manufacturing company of Beacon Lighting, Lucci Air produces multiple ceiling fan product lines under various names. It produces one of the larger ranges of models to choose from, including DC fans, as well as fans with pull-cord controls. Produced by Australian online lighting retailer Brilliant Lighting, this ceiling fan brand covers a spectrum of cheap to designer fans, in white, silver, black and wood exterior finishes. There aren’t quite as many models to choose from as other major brands, but it covers a wide spectrum of styles for all kinds of homes. Most mainstream ceiling fans in Australia use AC motors, however there are an increasing number of DC motor ceiling fans entering the market. DC fans work by converting the AC current from mains electricity into DC power before sending it into the motor. DC fans generally use less energy than AC fans – up to 70% less, in fact – and are usually very quiet. DC motors tend to be more compact, which allows for a slimmer design, and may have more speed options. However, DC ceiling fans are usually more expensive than their AC counterparts. While they do use less electricity, AC ceiling fans use very little energy to begin with so the long term savings may not be worth the larger initial cost. They’re also usually only remote-controlled – very few can be wired up to a wall switch. 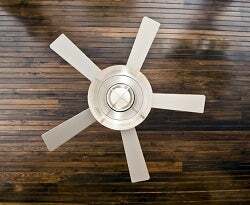 We’ve already written a breakdown of average costs to run a ceiling fan and how to choose the cheapest to run, but how about the cost of buying one in the first place? The price range is absolutely massive, ranging from as little as $40 to more than $1,000. The more expensive ceiling fans tend to be designer types, so if you’re just looking for something that does the job well and looks nice you don’t need to worry about spending a fortune. 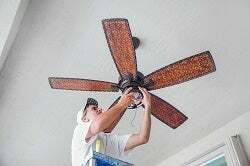 For a standard ceiling fan, you’ll most likely be looking at about $100 to $300 per fan. The other cost that can be easy to forget is installation. Ceiling fans aren’t something you can just install yourself if you’re not a qualified electrician, as it involves some significant electrical work. Installation costs can often exceed the cost of buying the actual fan, so bear that in mind if you’re on a tight budget. As with any renovation work, it’s worth calling around to find a competitive quote. Where can I buy a ceiling fan? Many lighting, hardware and electrical stores sell ceiling fans, as well as a number of dedicated fan and cooling retailers. There are also quite a few big online stores to shop from. However, regardless of where you end up buying your new fan, it’s a good idea to suss it out in person first. Ideally, you can see, hear and feel what it’s like in action. Once you’ve picked a fan, it may save you some money if you can find a better deal online. It makes it easy to shop around when many physical stores also offer online shopping. Beacon Lighting: Despite being primarily a lighting shop, they stock ceiling fans both with and without lights, across a wide range of brands and designs. Bunnings: The go-to for basics. Bunnings doesn’t stock many fancy or unique options, but does carry a basic variety on the more affordable end of things. Mitre 10: Australia’s other big hardware chain, the ceiling fans available vary depending on each individual franchise. Some quite small stores may not stock them at all, so call ahead first. The Good Guys: While most home appliance stores don’t stock ceiling fans, The Good Guys do. It may be more convenient to shop here if you’re doing a replace or renovation of more than just your cooling systems. Many retailers are standalone stores, or small chains found only in certain parts of the country. Don’t necessarily rule out your local retailer just because their name isn’t nationally known. Cheaper to buy and run, compared to air conditioners. You don’t need to worry about massive power bills if you leave a fan running 24/7. Use far less energy than air conditioners – choosing the fan over the air con can make a massive difference to your carbon footprint. Less effective at cooling than air conditioners, as they merely circulate air. Can pose a head injury risk when you combine a low-hanging ceiling fan and very tall people. There’s also other risks of having rapidly swirling blades in the room; standing or jumping on the bed can be dangerous, while flighted pet birds should never be in the same room as a spinning ceiling fan. Depending on the individual model, a ceiling fan can be noisier than an air conditioner. While any background noise will fade out of notice when you get used to it, it may be disruptive for light sleepers. The best answer to the ceiling fan vs air conditioner question is probably to have both. That way, you can save the air conditioner for only really unbearably hot weather.